SUGIHWARAS, Indonesia (AP) — A powerful volcanic eruption on Indonesia's most populous island blasted ash and debris 18 kilometers (12 miles) into the air Friday, killing three people and forcing authorities to evacuate more than 100,000 and close seven airports. The eruption of Mount Kelud on Java island could be heard up to 200 kilometers (125 miles) away, Indonesia's disaster agency said. 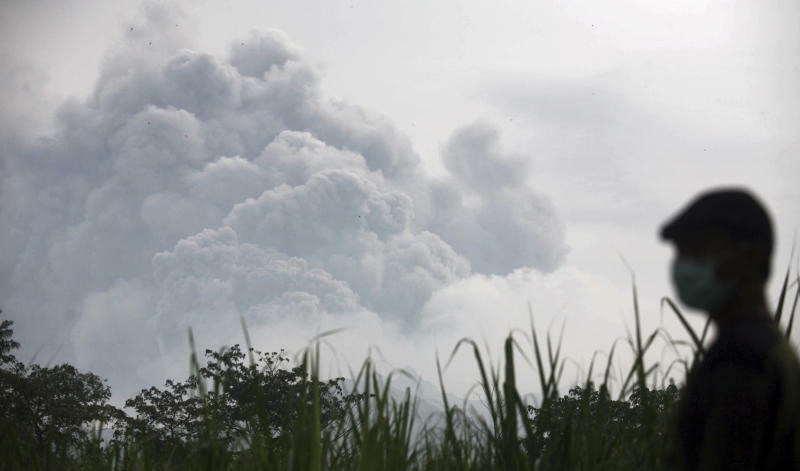 "The eruption sounded like thousands of bombs exploding," Ratno Pramono, a 35-year-old farmer, said as he checked his property in the village of Sugihwaras, about 5 kilometers (3 miles) from the crater. "I thought doomsday was upon us. Women and children were screaming and crying." Ash and grit fell to earth in towns and cities across the region, including Surabaya, Indonesia's second-largest city after Jakarta, with a population of about 3 million. It also fell farther afield in Yogyakarta, where motorists switched on headlights in daylight. Workers attempted to cover the famed ninth century Buddhist temple complex of Borobudur with plastic sheeting to protect it. A 60-year-old woman and an 80-year-old man were killed in the village of Pandansari, about 7 kilometers (4 miles) from the mountain, when the roofs of their homes collapsed under the weight of the ash and volcanic debris, the disaster agency said. A 70-year-old man died after being hit by a collapsed wall while waiting to be evacuated from the same village, where the volcanic ash reached 20 centimeters (8 inches) deep in some places. The large international airport in Surabaya and airports in the cities of Malang, Yogyakarta, Solo, Bandung, Semarang and Cilacap were closed due to reduced visibility and the dangers posed to aircraft engines by ash, Transport Ministry spokesman Bambang Ervan said. Virgin Australia said it canceled its Friday flights from Australia to several locations due to the eruption, including the resort islands of Bali in Indonesia and Phuket in Thailand. The disaster agency said tremors were still wracking the volcano but that scientists didn't expect another major eruption. It said residents of all villages within 10 kilometers (6 miles) of Kelud — more than 100,000 people — had been evacuated to temporary shelters, but that some were returning to their homes to begin cleaning up. The 1,731-meter (5,680-foot) -high mountain in eastern Java — Indonesia's most densely populated island and home to more than half of the country's 240 million people — had been rumbling for several weeks and was under close observation. The mountain is about 600 kilometers (375 miles) east of Jakarta, the capital. As night fell, the volcano continued to rumble, spewing ash high into the air, though smaller amounts than earlier. 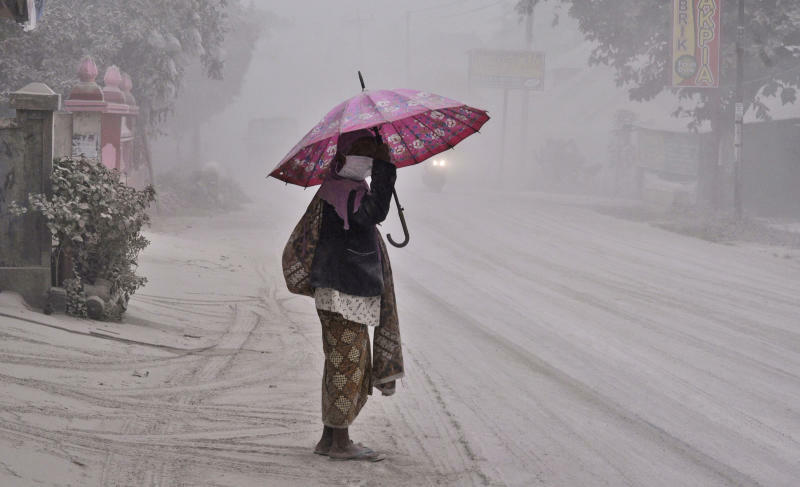 "It seems Kelud isn't finished yet," said Retno Dwiningtyas, a mother of three who was sitting in a government shelter watching television reports of her village showing crumpled roofs, farms and broken chairs blanketed with thick gray ash. "We are afraid for our cattle, our farm." Muhammad Hendrasto, head of Indonesia's volcano monitoring agency, said the mountain erupted violently about 90 minutes after authorities raised its alert status to the highest level. The disaster agency said it had spewed millions of cubic meters of debris into the atmosphere. Kediri, a normally bustling town about 30 kilometers (19 miles) from the mountain, was largely deserted as residents stayed indoors to avoid the choking ash. "The smell of sulfur and ash hung so thickly in the air that breathing was painful," said Kediri resident Insaf Wibowo. Some residents were shoveling the ash and grit into sacks to use in the construction of buildings or to fertilize crops. One collector said that middlemen had already told him they would pay up to $56 for a small truck filled with the debris. Kelud is among about 130 active volcanoes in Indonesia. The archipelagic nation is prone to volcanic eruptions and earthquakes because of its location on the Pacific "Ring of Fire" — a series of fault lines stretching from the Western Hemisphere through Japan and Southeast Asia. Due to the fertile volcanic soil and the shortage of space on Java, hundreds of thousands of people live close to active volcanoes. They are used to the rumblings, but their proximity to the peaks presents difficulties for authorities. Kelud's last major eruption was in 1990, when it spewed out searing fumes and lava that killed more than 30 people and injured hundreds. In 1919, a powerful explosion that reportedly could be heard hundreds of kilometers (miles) away killed at least 5,160 people. Earlier this month, Mount Sinabung in North Sumatra province erupted as authorities were allowing thousands of villagers who had been evacuated to return to its slopes, killing 16 people. 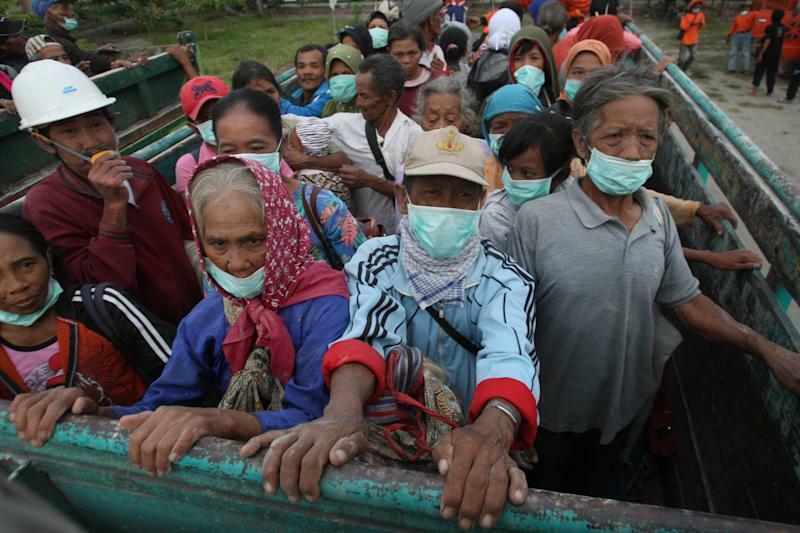 Sinabung has been erupting for four months, forcing the evacuation of more than 30,000 people.